Looking for the perfect holiday gift for the adventurer in your life? Well, your search can end right here. Amazon has a killer sale going right now on the insanely popular GoPro Hero5 Black Action Camera, dropping the camera to its lowest price ever. 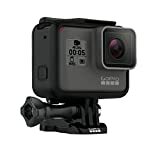 The Hero5 has never been under $300 before, but you can get one for just $289 if you don’t mind “E-commerce packaging.” Of course, why would you mind the box that it comes in? If it’s a gift and you do care about the packaging, you can still get a GoPro Hero5 Black in the standard packaging for just $10 more, which still keeps the price under $300. ✔️ This product is in manufacturer E-Commerce packing (see pictures). The product itself is identical to the one found in retail packaging & it is covered under full standard warranty. ✔️ Stunning 4K video and 12MP photos in Single, Burst and Time Lapse modes. ✔️ Durable by design, HERO5 Black is waterproof to 33ft (10m) without a housing. ✔️ Additional GoPro HERO5 Black Features + Benefits below on item page. ✔️ Preview and playback your shots, change settings and trim your footage, all on your GoPro.